Thanks to Tom Herbst for interferometry testing and permission to reprint! 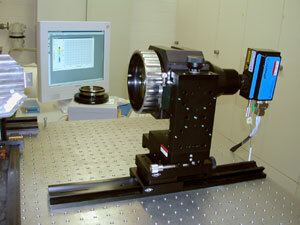 The FISBA interferometer mounted on a stable optical bench. The computer in the background controls the instrument. We do a lot of optical design and instrument development at my workplace (the Max Planck Institute for Astronomy in Heidelberg Germany). In order to evaluate the surface quality of optical elements, we recently acquired a FISBA interferometer (see picture at right). This instrument maps surface deviations using a sensitive laser interferometer. Aberrations corresponding to a small fraction of the wavelength of light can be identified using a quick lab test. When we took delivery of a special adapter lens permitting analysis of small flat surfaces, I jumped at the chance to try it on one of my faceted gemstones. Standard round brilliant used for the facet flatness test. The image at left shows the gem I selected for the test, posing in one of the holes in the optical bench. 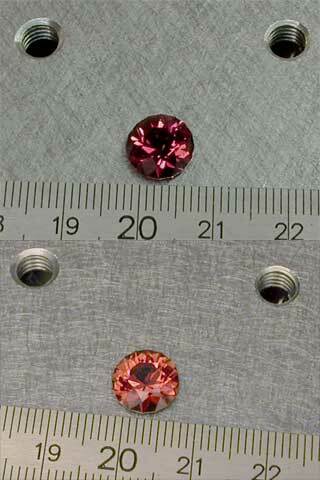 It is a standard round brilliant cut in colour-change tourmaline. The upper photograph shows the stone under fluorescent lighting. In the lower frame, an incandescent desk lamp provides the lighting. I had no idea that this was colour change tourmaline when I purchased the rough. In fact, the original stone looked for all the world like "standard" pale pink tourmaline. This stone seemed to be the ideal choice for the test, since its table is approximately the same size as the field of view of the adapter lens. I cut this stone using a 1200 Crystallite, followed by a 1200 NuBond, and finishing off with a BATT lap charged with 50k diamond. Although it is fairly well cut, I did not take any extra care to ensure excellent polish, flat facets, etc. It represents typical results from this polishing sequence. Laser fringes at the edge of the table facet. With the gem held in place with plasticene (Play-Do), we quickly managed to locate the table facet and detect fringes. The alternating dark and light bands result from interference of the laser radiation, (hence the instrument is called an interferometer). For a perfectly flat surface, the fringes should be parallel and equally spaced. The field of view is slightly less than 2 mm in diameter. 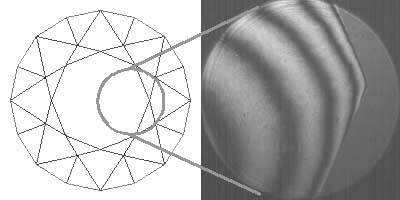 Note that because of the way the FISBA operates, no signal appears from the star facets. The figure below shows the surface analysis performed by the control computer. As expected, the worst deviation from perfect flatness appears at the edge of the facet (this is known as a "turned edge" in the optics biz). Nevertheless, the overall quality is excellent: the maximum deviation ("peak to valley") is only half a wavelength, about 0.3 microns or 1 / 100,000 inch. The average surface quality (RMS or root mean square) is about 10 times better, or a twentieth of a wave. In the center of the facet, things are even better. 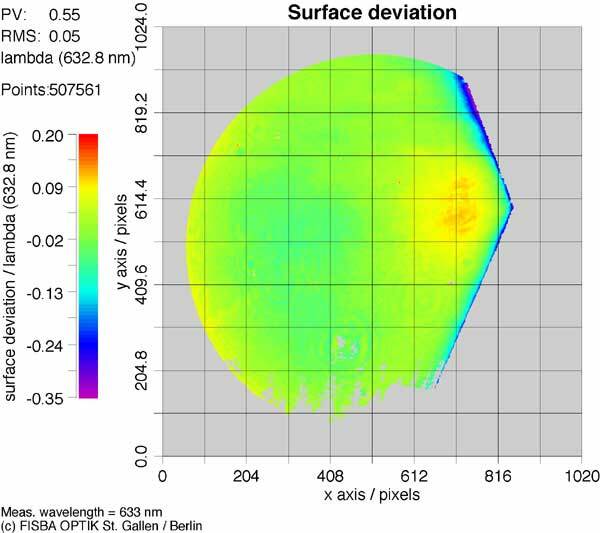 While such surface flatness is routinely achieved in high quality optical components (particularly over relatively small areas), I was pleasantly surprised to see how well the BATT lap performed. Congratulations to Gearloose - the BATT does FLAT!